With three blogs, it's surprising how rarely one topic carries over from one blog to the other, but this is one of those times. 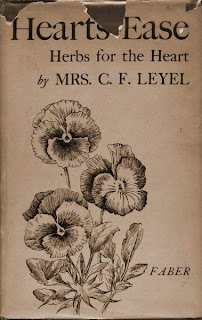 Today at a local antique shop I found a rare herbal book, Hearts-Ease, by Mrs. C.F. Leyel, one of the most respected herbalists of the last century. She singlehanded saved the knowledge of natural medicine in the United Kingdom, pushing forward even after the 1941 Pharmacy Act made her practice almost illegal. Wander here for more on that topic. Meanwhile, this amazing book has detailed line-illustrated plates, and fourteen indexes. Each herb is detailed to a minute degree. 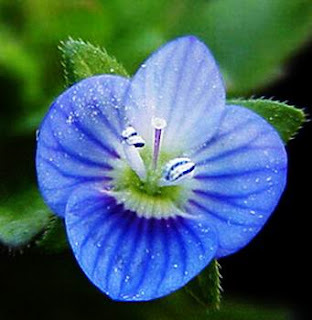 The Speedwell is almost the first blue flower to appear in the hedges, and is so truely the colour of the heavens, or as the Chinese say, ;the sky after rain', that it is not surprising that it should have been chosen as a subject for legends. A long account of the healing properties of an allied species, veronica orientalis, was written by Francus in 1690, in which an account was given of a king of France being cured of leprosy by it. A woman who was barren gave birth to children after taking it. A few years later other reports were written by Hanniel, at Dusseldorf, and by Hoffman. Hoffman considered it a particularily efficacious remedy for catarrhal complaints and recommended it for asthma. As an herbal goes I can't really ask for any more. Necessary Disclaimer: the gentle reader should not infer that they are to go out and pick large amounts of speedwell (forget-me-nots) and ingest them. No matter how beautiful they are. If you're like me, you have several calendars about thehouse. I have one at my desk for billpaying and a second for my bookselling. A third on the frig door for appointments and family events and a fourth for gardening schedules. And, until recently, another for homeschooling records. As much as I love the beautifully photographed calendars the bookstore sells, it isn't happening in our budget. Even the Dollar Store versions cost more than my solution. Every year I print my own. Takes 15 minutes, and a minimum of 48 pieces of paper (for four calendars), plus the ink. Done. Thanks to these lovely people at Vertex42 I have access not only to calendars, but all sorts of forms and lists and logs. My next stop is their debt reduction calculator. Chewy wishes each and everyone of you and yours a healthy, safe and prosperous New Year! Never Mind the Snow! Think Rain Barrels! 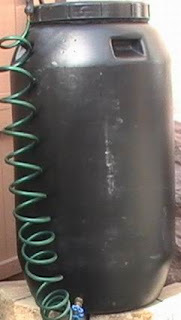 Those of you who have been reading here for awhile know about my rain barrels. For the rest of you, suffice it to say it is an obsession with me. Our county went through a couple years of drought and rationing, and I built my system large enough to store almost 500 gallons. Then last summer we bought a pond form, and started laying plans to connect a pump to the barrel system that would pump the overflow into a 115 gallon wetlands holding pond, where it could be released through drip irrigation to the blueberry patch and then downhill to the tomatoes, gourds, peppers, etc. (Plus a friend has offered their used pond form which appears to be another 100 gallons or so, and we'll try to hook it up as well). Never mind that this appears to be one of the wettest winters we've had in ages. Put that thought right out of your mind. The drought will return. It nothing else, I can store enough water to negate any outdoor water usage on my town water bill. These are my water barrels (the Greeks as they are known,since they started life in Greece carrying olives), and the older trashbin system in the background. All in storage for the winter, and actually at the moment covered in deep snow (we got 16" this last weekend). Most importantly, this is an example of the four *new* formerly-pickle-barrels-now-rain- barrels I picked up today from a wonderful guy on Craigslist. Thanks to Jonathan in North Carolina who hauled a huge load of barrels up here this morning and fueled the obsessions of the Roanoke water barrel fanatics! These four will replace the original "trashbin" system, and the trashbins will go out to Dad's farm so he can use them to store drying walnuts. 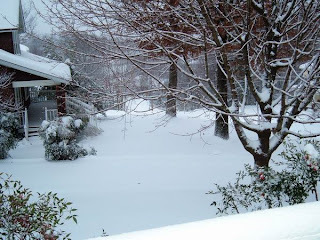 So far so good - got power, got heat, got gas for the snowblower (which is probably the only one in town- we are popular with neighbors today). Also got 20" of snow. This is before the big earthmover (road grader?) came through to plow. Last night it was pulling commercial tow trucks up this hill. You can't even see the road anymore, but it's there, twisting and turning down towards the creek. Last night, it looked like it must have looked a hundred years ago - a narrow snowy country lane. And this is my Swing Garden. 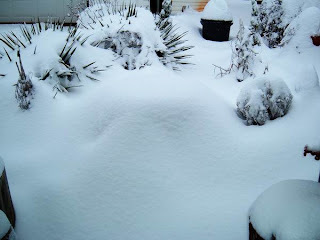 Someplace under there are the water gardens. Slightly different than summer. North Dakota so it is geared for the cold, and the snow weight. I'm just not too sure about the wooden frame. 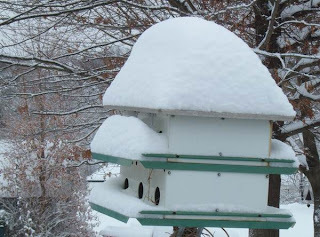 Even the birds are snowed in. 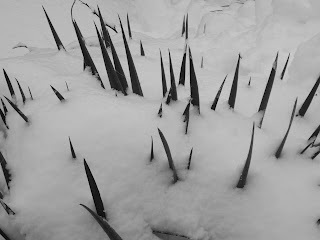 And the yellow jackets under the yucca won't be coming up anytime soon. About noon, this little snow plow showed up, but he decided didn't want to try the hill and headed off to the courthouse instead. Meanwhile the rest of the state and southern West Virginia are a mess. Interstate 81 has hundreds of tractor trailers jackknifed and waiting for the National Guard to figure out how to remove them. This has cause a 15 mile traffic jam, with who knows how many people stranded overnight. The West Virginia Turnpike came to a complete stop overnight, with stranded motorists spending the night high in the mountains in their vehicles. They hope to get those pileups cleared sometime this afternoon. Wherever you are, be glad you're not there. This was actually earlier this afternoon, when we were still at the 3" level. But at the moment, out there in the dark, it's at approximately 9.5". The road has disappeared, and the hill we sit at the top of is impassable (except for a giant earth mover that went by pulling a commercial tow truck carrying one of those big fancy pickups. Pickup was crumpled. I'm thinking it's owner tried to drive down the hill). After living in Minnesota for 23 years, driving in the snow is as easy as breathing or walking, but throw in a move to Virginia 12 years ago, and global warming, and now it's nervewracking. 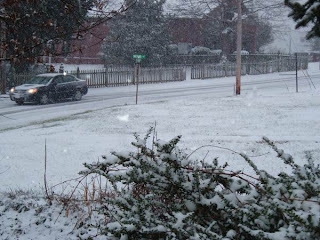 Especially when surrounded by native Virginians who haven't got a clue how to drive in this stuff. Plus the 45 degree mountain roads. 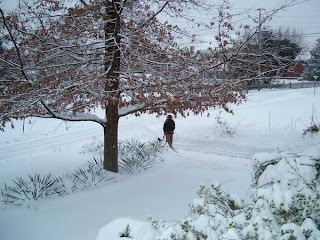 Plus our usual winter consists of a couple icy slushy days, and its over. This weekend we make up for that. 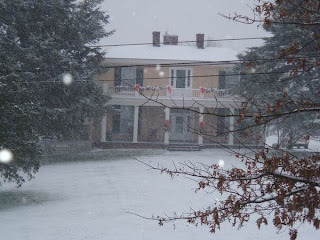 Our neighbor's house, circa 1865. This weather sets it off beautifully. This driver is headed directly past our house, which means they are looking down a 45 degree snow-packed hill, and thinking this might not be a good idea. They were right. It's a weekend for staying home. I just wish I'd picked up a gallon of paint this morning. I could have painted my office as long as we're snowbound. 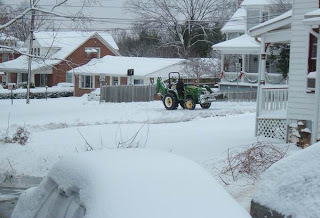 Did I mention our town doesn't own a snowplow? A couple weeks ago I received a great offer from Mother Earth magazine: the entire Mother Earth news archives from 1970 through 2008, on CD, for $29.95 (the deal is still available). 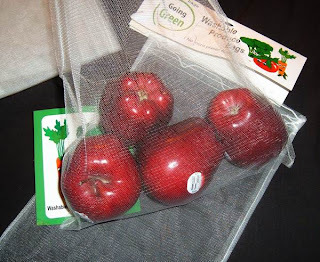 As an extra incentive, they threw in a pack of 6 washable reusable produce bags. I actually received the CD within days, and had completely forgot about the produce bags until they arrived today. These nifty little bags are such a simple idea: scrap nylon net, with a lightweight nylon drawstring at the top. Perfect for letting fresh produce breathe, and washable! You can take them to the store or farmers market, use them to store veggies or fruit in the frig, and I'm thinking I can stuff my pockets full of them when I go to pick blueberries next summer. Plastic bags emit ethylene gas, causing produce to ripen more quickly than they should. 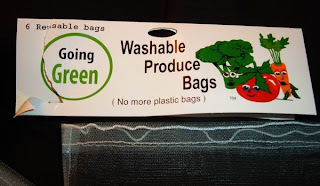 You may have seen the green plastic produce bags sold on TV - they've been treated not to emit the gas, but, hey, they're still plastic. These nylon net bags eliminate the whole problem. The bags measure 11" x 14", and there are 5 for $6.99. Plus the bag they are packaged in is another net bag, size 8"x12". If I had my druther's, I think I'd like at least one just an inch longer, for celery and romaine (we buy a lot of romaine), but other than that, this is a great little deal and another step closer to being green. FTC Disclaimer: They didn't give me the bags. Mother Earth News did, but only after I bought their Archive CD, which is pretty cool too. 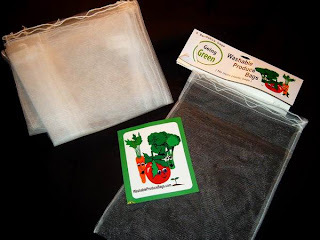 Warning: This post has nothing to do with gardening, green-life style, or how to make your own detergent. This post is what happens when you've spent your day in Christmas traffic jams, staring at traffic lights. Why are traffic lights red, yellow and green? Who decided against orange, white and blue? Or red, white and blue for that matter? It's things like this - thoughts I mull over while staring at 50 sets of red brakelights, and the all-powerful traffic signals- that drive me nuts until I know the answer. In case you're the same way, here's the scoop. It takes a very long distance to stop a train. So the first signal to stop a train was a fire built between the rails. Meanwhile in 1868, London had the first crude gas lantern designed to control carriage traffic. It used red and green glass plates that were operated manually by a policeman. When it exploded, killing the operator, it became the last traffic signal, until electricity was invented in the late 1800's. One of the first uses for this new technology was an electronic railway signal: green was on top as the universal signal for "all clear"; red was below it, of picked to be the color for "stop", being the same color as the fire that was already used to stop the trains. Then white was added for the lowest signal, as a caution or warning light. Eventually, in the early 1920s, automobiles had grown to such a volume that traffic was chaotic and out of control. An African American inventor, Garrett Morgan, designed and patented the first electronic traffic light. He chose to use the railway system light colors: red for danger or stop, green for proceed safely, and white for caution. The order was changed, to differentiate the lights from the railway signals. Trains run on tracks, disregarding street lights. When a white railway bulb burnt out, it was not as big a problem as when a white traffic signal bulb burnt out, causing drivers to mistake the white bulb of the corner street lights for the signal, jamming on their brakes for no reason and thereby inventing the multiple vehicle pile-up. Several hundred insurance claims later, white was exchanged for yellow, a color associated with sunny warmth and happiness. Now everyone would be happy about stopping for that red light. Psychologically red creates tension and nervousness in the brain, alerting our thought process that a decision is imminent, while green is soothing and calm. "Red light stop, green light go, yellow light go very fast." I've been putting off gathering basil seeds, mostly just because I've been busy. But tonight is the full moon, and they needed to be harvested in the next couple days. All those old gardener tales about planting by the lunar cycles have some truth to them. There are two waxing (increasing) lunar quarters, and two waning (decreasing) lunar quarters. The full moon falls right in the middle. During the waxing quarters, the pull of the moon raises the water table, and plants draw up water faster, making it a better time to plant. 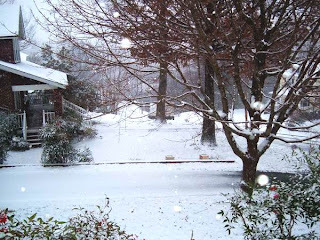 The waning phase is better for pruning and weeding. Some evidence also exists showing larger harvests among gardens planted following the lunar cycles. Quarter 1: The waxing phase that begins with the new moon is the best time to plant above ground leafy vegetables. Plants that respond well during this quarter include broccoli, cabbage, lettuce, spinach, celery and cauliflower. The water table is rising and the plants will take up nutrients and germinate quickly. 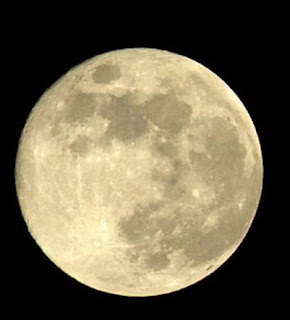 Quarter 2: The gravitational pull of the moon is less but the additional light theoretically aids leafy growth. Vegetables that respond well to being planted in this phase include those that form internal seeds like beans, peas, tomatoes and vine crops. The second quarter is also where vegetables should be harvested. This is when their moisture is at its peak. Quarter 3: Just past the full moon, the water table is dropping and growth is slowing. This is the best phase for planting root vegetables such as potatoes, carrots, beets and onions. 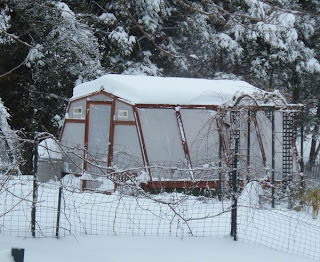 It's also a great time to do any pruning in the garden that is needed. The cut ends will lose less moisture or sap during this period. Quarter 4: A dormant period and no planting, harvesting or pruning should be carried out. This time is best used for weeding, turning the compost and other garden chores. Tomorrow night, I'll be harvesting my basil seeds -sweet basil, Greek columnar basil, lemon basil and my new favorite, boxwood basil. And feeling somewhat like a oldtime pagan out there, harvesting by the light of the moon.